BED & BISCUIT and SPELL KEEPERS. All three shows produced by Nutz Productions. 7 August 2018 – Global content and media producer and distributor Keshet International (KI) has signed two separate deals for a raft of tweens’ and teens’ finished content following its recent distribution partnership with Ananey Communications Group. KI has licensed HBO the SVOD rights to all three seasons of the Israeli ratings record-breaking daily-drama THE GREENHOUSE (175×22’; החממה) alongside three seasons of the live action series SPELL KEEPERS (150×22’; כדברא) for its subscription services in 13 countries across Central Europe. Meanwhile KI has also sold Portugal’s SIC three series of the sitcom BED & BISCUIT (totalling 51×22’; בית הכלבים) and the first series of SPELL KEEPERS (50×22’) in a separate deal that will see the Impresa-owned channel dub, rather than subtitle, both series for its local audiences. All three of these Hebrew language series originally premiered on Nickelodeon Israel and Teen Nick exclusively on Yes TV and are produced by Nutz Productions, a subsidiary of the multi-channel group Ananey Communications. These two high-volume deals follow KI’s recent strategic move into the kids’ market, first launching a dedicated kids’ division headed by new hire Nicola Andrews, and then establishing an on-going content partnership with Ananey Communications Group – Israel’s leading kids’ content provider – to bring teens’, tweens’ and kids’ programming to a wider global audience. Created by Michal Cooper-Keren and based on original idea by Sivan Shiknagy and Einat Shahak, SPELL KEEPERS (S1, S2 and S3, totalling 150×22’) is an exciting, mysterious and fantastical daily-drama series focussing on two strong and determined female heroines – Kirki and Laila. The Spell Keepers are a secret group of good witches called Kadabras, whose role is to protect humanity from supernatural creatures who threaten to harm them. Together, they are the strongest force in the supernatural world. They control the four elements of nature: wind, earth, fire and water – and they can perform magical feats, such as create storms or floods. Created by Giora Chamizer, THE GREENHOUSE (S1, S2 and S3, totalling 175×22’) centres on a brother and sister who, after losing their mother in a spaceship crash, arrive at an elite boarding school for gifted future leaders: The Greenhouse. They join two competing houses within the school. Soon, mysterious developments draw the rival houses into a secret investigation where they expose a destructive plot. Only by joining forces can they save the country from a disaster. Having broken ratings records on its debut in Israel, this live action series has also been adapted into an English international version entitled GREENHOUSE ACADEMY by Ananey’s Nutz Productions for the streaming giant Netflix. 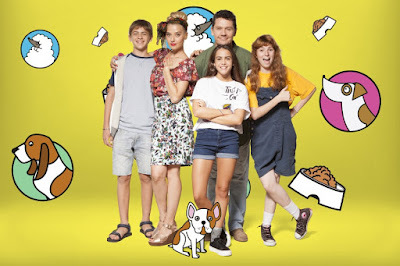 Created by Hagit Bilia and Lior Kfir, BED & BISCUIT (S1, S2 and S3, totalling 51×22’) is a sitcom for younger kids, which takes place in a family-run boarding kennel for dogs in a small village in Israel. Moti is a mediocre lawyer who has had enough of the big city and wants to live a simpler life and spend more time with his only daughter Ori. Together, the energetic father and smart and funny daughter make the move into the country to run their family business – a dog kennel. Other live action series that are part of KI’s slate of finished kids’ content produced by Ananey’s Nutz Productions include CRAFT PARTY (22 x 10’), a colourful and inspiring series presented by two nine year old girls that celebrates the art of crafting and DIY for younger children; and THE HOOD (S1, S2 and S3, totalling 150×22’), a daily drama that skilfully combines edgy class struggles with suspenseful action and big doses of fun, as widower Ben’s kids prank the community’s snobbish teens with hilarious results, all while searching for a mystical treasure that could change their lives forever. Keshet International is a leading global content and media producer and distributor. It is part of the Keshet Media Group, Israel’s most successful media company. Headed by CEO Alon Shtruzman, KI’s portfolio includes seven local production and distribution hubs in addition to its Tel Aviv HQ – Keshet UK, Tresor in Germany, Keshet Asia in Hong Kong, Keshet India, as well as Keshet Digital Studios, Keshet Films and Keshet Studios in the US – and a majority stake in Greenbird Media. Established in 2012, KI offers original content developed and produced within this network of companies, as well as curated third party IP. KI’s boutique catalogue of finished content and formats spans a broad range of scripted and non-scripted programming, including drama, comedy, entertainment, game shows, kids’ and factual. Highlights include the 2018 Cannes Series’ winning drama and ratings smash, When Heroes Fly; addictive game show The Search; factual series Bad Habits, Holy Orders and World’s Most Evil Killers; successful talent competitions Rising Star and Masters of Dance; gripping espionage thriller False Flag and Prisoners of War, upon which the prime time Emmy® winner Homeland was based; and international Emmy® Award-winning ‘buddy comedy’ Traffic Light. Founded by Udi Miron in 1996, Ananey Communications is the leading multi-channel TV firm in Israel. With 11 original lifestyle TV channels and exclusive representation of the Viacom brands in Israel (including MTV, Comedy Central, Nickelodeon, Teen-Nick & Nick Junior), Ananey channels reach a total of 76% of all Israeli households. Founded in 2010, Nutz Productions is the high-end concept and production arm of Ananey, which produces all the original series for the Viacom brands, as well as for other Israeli networks. The company also develops content in close cooperation with foreign production entities, honing its expertise in international productions. Recently, Nutz Productions was commissioned by Netflix to produce its remake production of Greenhouse Academy – an original live-action daily-drama series which was first broadcast for 4 seasons on Nickelodeon Israel and locally produced by Nutz as well. SIC Television was launched in 1992 as the first private channel in Portugal incorporated in Impresa Media Group. Along with free-to-air SIC, Impresa also owns seven cable channels under the SIC brand: SIC Noticias (24 hour news); SIC Mulher (female audiences); SIC Radical (male audiences); SIC K (kids); SIC Caras (entertainment and lifestyle); SIC International (communities abroad), SIC International Africa (communities abroad in Africa). Publications Expresso (newspaper) and Blitz (music magazine) are also part of the media group. SIC Content Distribution is Impresa’s content distribution department. As a broadcaster, SIC produces and distributes a wide range of content produced daily on a B2B and B2C model worldwide. The Greenhouse has also aired on Nickelodeon UK & Ireland. More Nick: Nickelodeon Israel Mines Seam of Successful Locally Produced Shows to Become Highest Rated Kids TV Channel in Israel! H/T: Kidscreen; Additional source: TelevisionPost. Follow NickALive! on Twitter, Tumblr, Google+, via RSS, on Instagram, and/or Facebook for the latest Nickelodeon Israel News and Highlights!